← What is the #1 reason to buy a new car? When is it time for new windshield wipers? The other day I had my car serviced here at Koons and during my complimentary 27 point inspection my Service Advisor pointed out my wiper blades needed replacing, so I took his advice and had them replaced. As I was driving home that day it began to rain and I couldn’t believe how much better I could see with my new windshield wipers. It made me think, how often should someone get their windshield wipers replaced? After a quick Google search I found a lot of different pieces of wiper advice. Most experts recommend having your windshield wiper blades replaced every 6 to 12 months. Depending on where you live you may even need to replace them even sooner. The winter months put your windshield wipers through a lot between the cold weather and the wear and tear of wiping snow, sleet and mud off your windshield. The scorching heat of the summer months can put extra wear on the rubber part of the wiper blades. Although most experts recommend getting your wiper blades replaced every 6 to 12 months your best bet might be letting your eyes and ears be the judge of when they need to be replaced. If your windshield wiper blades begin to leave streaks and are having trouble clearing water, snow and slush it might be time for a replacement. Also, if you begin to hear them scrapping and chattering on the window it may be time as well. One more bit of advice, before you go and spend the money on new wiper blades try wiping the rubber part of the blades with a clean wet rag and readjusting the wiper arm on the glass so it is fitting properly on the glass. If that doesn’t help then it is time to check out Koons service and find the dealership closest to you to buy new wiper blades. 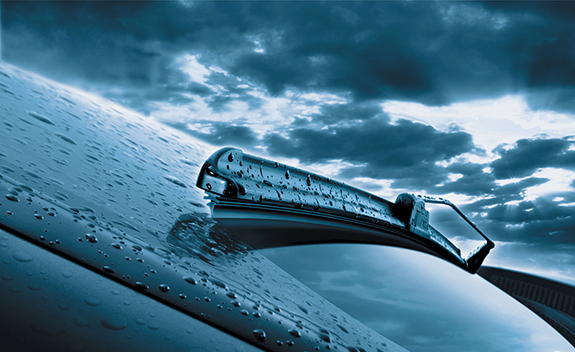 With a new set of wiper blades you will be ready to face whatever conditions the weather brings your way. Safe Driving! Posted on January 20, 2014, in Automotive, Maintenance Monday and tagged Jim Koons, Koons, Koons Automotive, Maintenance Monday. Bookmark the permalink. Leave a comment.